Mesotherapy is a safe, natural alternative to invasive cosmetic procedures. Mesotherapy process delivers vitamins, minerals and amino acids directly into the skin to nourish and rejuvenate, promote production of collagen and elastin. PRP works in harmony with your own body to naturally promote a process for new tissue and collagen growth. Areas of treatment include cheeks and mid face, wrinkling around the eyes, smile lines, neck and jaw line, décolleté, acne scarring, hands and more. Fractional skin resurfacing uses laser energy microbeams to create areas of affected tissue that extend through the epidermis into the dermis. Non-ablative procedures are minimal to no downtime procedures. The body’s natural healing process creates new, healthy tissue to replace the areas of affected tissue, resulting in healthier, younger-looking skin. 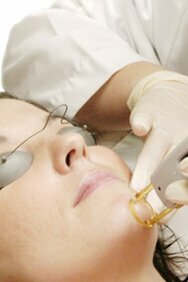 Uses radiofrequency to tighten skin, and decrease fine lines and wrinkles. A painless and gentle way to reduce the signs of aging without surgery or downtime. The name is confusing, because there was VelaShape I and II before, and neither device was great because they both required multiple treatments, as well as frequent follow-up treatments to maintain results. We try to explain to our patients that the latest VelaShape III is NOTHING like Vela I or II, so they cannot compare the new machine to the old. However, the names and numbers do make it confusing for the consumer to know exactly which device is being used, so we’d like to try and explain why we are so intrigued and happy with the new VelaShape III. Overall, VelaShape III is now one of the most advanced technology that is FDA-cleared for reduction of cellulite, circumferential fat-reduction and skin tightening. The only thing is that results are not yet permanent, however you may achieve long-lasting results with a follow-up treatment annually to maintain very acceptable results! VelaShape III technology combines infrared light, bipolar radiofrequency energy and vacuum, which causes deep heating of the fat cells, their surrounding connective tissue and the underlying dermal collagen fibers. This promotes the stimulation of the growth of new collagen and elastin, which can result in a localized reduction in skin laxity, body volume, and an overall improvement in skin structure and texture. VelashapeIII does work and is the only non-invasive machine to combine four different technologies including IR(infrared), Bi-Polar RF(radio-frequency)and mechanical tissue manipulation using a pulsed vacuum and massage rollers. The combination of the IR and vacuum coupled RF technologies causes deep heating of connective tissue, which in return stimulates collagen. With the series of 5-6 treatments, one week apart we have seen significant improvement in skin elasticity. To maintain the results, follow up treatments is required. What can I expect from VelaShape III treatments? What is the VelaShape III procedure like? Most patients find VelaShape III comfortable and describe the treatment as feeling like a warm deep-tissue massage. To combat this discomfort, treatment parameters are easily adjusted to ensure a comfortable treatment experience. It is normal to experience a warm sensation for a few hours post-treatment. Some patients report a pinkish appearance of the treatment area that may last a few to several hours post-treatment. VelaShape III utilizes vacuum technology to manipulate your skin while infrared light (IR) and bi-polar radio frequency (RF) energies may gently heat fat cells and surrounding tissue. VelaShape III technology combines infrared light, bipolar radio frequency energy and vacuum, which cause deep heating of the fat cells, their surrounding connective tissue, and the underlying dermal collagen fibers. This type of efficient heating and vacuum stimulates the growth of new and better collagen and elastin which results in a localized reduction in skin laxity, body volume, and an overall improvement in skin structure and texture. My wife had PRP treatment done for a facial and she looks great. This is the cheapest we have found for PRP and they also price match, which we haven’t been able to find elsewhere. Will be recommending this place to friends. I just want to say how pleased I am with the laser skin tightening treatments I have undergone at this clinic. Now that I have just finished my 6th treatment, I can really see results. People don’t believe me when I let them know that I am 51 years old!! The treatments have eliminated most of the cellulite that has plagued me for most of my life and I understand that I will continue to see improvement during the upcoming months. I had spent a fortune on a different kind of “anti-cellulite” procedure at another place and was very disappointed with the high cost and lack of visible results. I would not hesitate to recommend the procedure offered here. I honestly still can’t believe it… the staff are a pleasure to deal with – very personable, accommodating, and knowledgeable, especially Bahar! Thank you!! !